Science has made phenomenal discoveries within the last one hundred years but even still some things just can’t be explained. One such ghostly tale must be among those unexplainable events as it occurred many years ago in a soon-to-be real Texas ghost town, a place forgotten by a world of high-tech devices, modern conveniences and the worries of the day-to-day rat race. The place was a small community called Thurber located in the far ends of the Palo Pinto hills just on the Palo Pinto and Erath County lines. Today, the only thing that remains of the old mining town is a very impressive smokestack towering next to row of aged brick buildings, one of which houses the Smokestack restaurant on Interstate 20 about 75 miles west of Fort Worth. During the late 1800s Thurber was a thriving coal mining town with a population of approximately 8,000 souls. Unlike most towns, especially in Texas, Thurber was constructed and owned completely by the Texas and Pacific Coal Company which was headed up by Robert Dickey Hunter and H.K. Thurber of New York. Hunter constructed the town while dealing with the dissident union miners associated with the “Knights of Labor,” who had been working in the mines there since the mid 1880’s. He fenced off the property owned by the company constructing an entire town and mining complex complete with schools, churches, saloons, stores, houses, a 650 seat opera house, a 200 room hotel, an ice house and an electric plant. The union was not allowed inside. Eventually the miners’ strike ended and the families moved into the company owned town. Along with the mines, the company owned commissary stores where the town’s people purchased necessities with the use of “scrip’s” which were redeemable anywhere in Thurber. In 1897, a large brick plant was built as well. Hunter, also a partner in this enterprise employed many other types of labor. A stockade, armed guards and barbed wire fence restricted labor unions, peddlers and other unauthorized people from gaining access to the town. Hunter retired in 1899 and a man named William Knox Gordon took over retaining company dominance about the community. Concentrated efforts by Gordon to keep the union affiliation out of Thurber failed by 1913 and Thurber became a union stronghold for the immigrant workers and remained so until about 1920. By that time locomotives, the primary source of transportation, began to burn oil instead of coal. Gordon, being an opportunist, discovered the huge Ranger oil field just west of the Thurber mines and changed the company name to Texas Pacific Coal and Oil Company in 1918. The conversion of the nation from coal to oil along with the consistent union strikes led to Thurber’s demise. The need for workers began to dwindle and many miners moved away by 1927. The brick plant remained open until 1930, a general office until 1933, and commissary stores until 1935. By 1939, the company basically dissembled most of the town and concentrated their interests toward the oil fields. The once thriving Thurber became a ghost town. It was the beginning of the Great Depression which hit Texas harder than most other states. Many grown and able-bodied men were out of work and taking any job they could find so it was rare that two boys could find work. But they did. Walter and Frank would walk down to a local Mexican restaurant on Saturday nights, one of the few establishments left in Thurber, after closing hours to assist the owner with rolling tamales. “One particular night,” Walter said, “was very clear with a beautiful full moon hanging low upon the summer horizon.” The two boys finished their work at the restaurant about midnight and after collecting fifty cents each, they headed home down an old dirt road that paralleled a set of railroad tracks that took coal cars to the town of Mingus, a few miles north of Thurber. After that night, Walter said his brother refused to speak of the incident and didn’t want anyone to know of their encounter with the ghost. Walter went on to say, “If people say that I didn’t see a ghost, you tell em to come see me! I saw it with my own two eyes and I know what I saw.” Rumors of the haunting floated in and around Thurber for a few years, however, Walter only personally knew of only one other person who claimed to have witnessed the ghost. The man, a friend of Walter’s father, told Walter and his family of the night he was walking toward his mother’s house, just about the same spot where Walter and Frank saw the ghost. He claimed on a moonlit night he came upon the ghost of a woman sitting on the stile at the fence. He said he was somewhat under the influence of strong drink when he approached the woman thinking it was his mother. “Suddenly”, he said, “she began to rise up into the air before fading away right in front of my eyes.” He then said he’d never sobered up so quick in all his life. Since then, the road no longer exists. Pasture has reclaimed it and the fence has been gone for many years as has anyone who may have encountered the specter. Walter unfortunately passed from this world in 2006 taking any other information of the ghost with him. The ghost town of Thurber Texas was once a thriving place teaming with immigrant workers, mostly Italian, Hungarian and Mexican trying to make a living for themselves and their families. The great flu-pandemic of 1919 took the lives of at least 20 children and several adults in Thurber. Other sicknesses and difficulties plagued the immigrant town as well. A ghost in Thurber could be just about anybody. Walter had many fond memories of growing up and living in the Thurber and Strawn communities. The coal mines are long gone but reminders of their existence still dot the countryside around the area of southwestern Palo Pinto County. No record exists of the murder of the beautiful carnival queen but that doesn’t mean that the event didn’t happen. Such a person in such a transient profession could have never been reported as the carnival moved on to another town. If a ghost still exists in Thurber, the only live people it would find to haunt would have to be at the Smokestack restaurant which has reported their own accounts of ghostly happenings over the years. But if you want to see the ghost of the carnival woman, you’ll have to stand out in the field where the road once was. The problem is nobody knows exactly where that was or at least, none of the living. Happy haunting! Thurber, Texas 32.506599, -98.418121 Story: The Ghost of Thurber, TexasGhost town of Thurber, TX. From Wikipedia: \"Thurber is an unincorporated community in Erath County, Texas, United States (near the Palo Pinto county line), located 75 miles west of Fort Worth. It was, between 1888 and 1921, one of the largest producers of bituminous coal in Texas and the largest company town in the state, with a population of over 10,000. 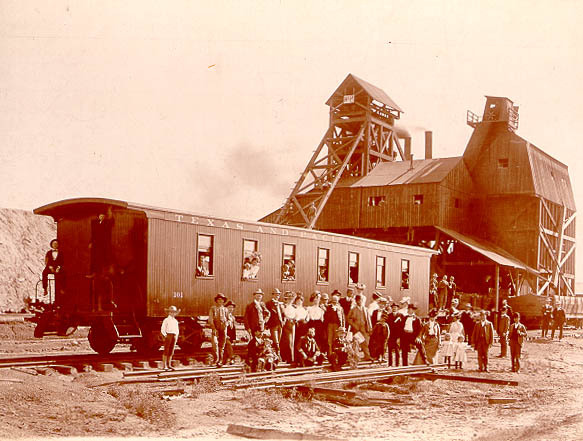 The population of the community is 48 per the 2010 United States Census.\"
It seems there are a lot of stories like this based around the railroad workers and mining towns. It is a shame no one knows where the road is, I’d like to visit. If you want to go to the town itself, there’s a map and links at the bottom of the story. In 2012 my husband and I were with a ghost hunting group and we experienced evps which I wrote down in a book and also both saw an apparition that in a second rushed towards us then flew apart in sparks. Thanks for posting this story. I recently discovered my great-great grandfather John Norath was one of the miners there in its hayday of the 1890’s. One of his sons was born there. Need to go to trace my roots and see a true ghost town!